Muscle recovery is an important part of every exercising routine. After each workout you need to make sure your muscles recover properly before you hit the gym again. Beginners are more likely to experience muscle sourness after the first few workouts simply because their bodies are yet to adjust to the workout sessions. 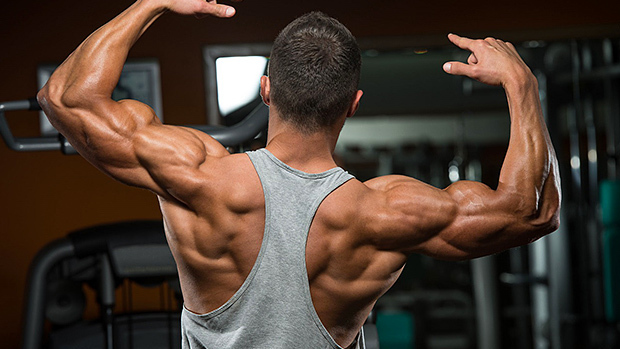 However, this can also happen to bodybuilders and professional athletes. They might experience pain in the muscles and limbs when increasing the intensity of their workout or when they expand their routine with more demanding exercises. Muscle pain is the direct result of inflammation within the muscles. When performing any kind of workout, be that weight lifting or running, your muscle fibres break down due to the enhanced pressure they have to endure while doing such an activity. After each workout, the fibres expand and become stronger, so next time they can withstand the exercising pressure better. A lot of people prefer to stay away from pools this time of the year, but not triathletes. Experienced and aspiring triathletes and swimmers use the off season to get ahead of the curve. For most triathletes, swimming is the biggest nemesis in races. Trying to compete in three disciplines is challenging, so it’s of utmost importance to make sure when an athlete goes in the water, they make the most out of the session. 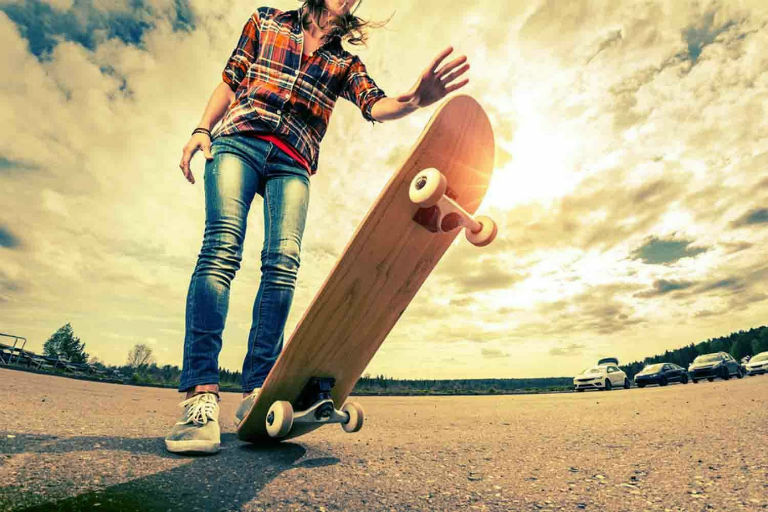 Skateboarders – you can’t just not love them. 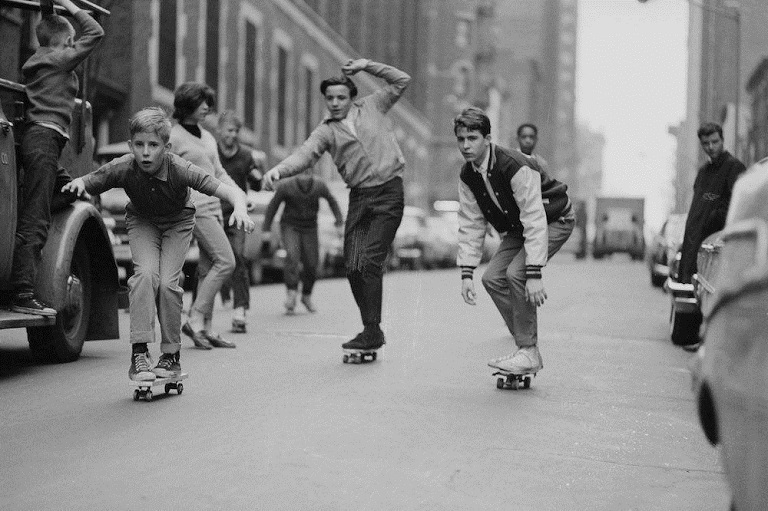 Everything about skateboarding is so cool, restless and simply awesome. We love their style, their moves, their skateboard decks, their shoes, their adrenaline-filled yet often-times funny youtube videos…that’s why many of us want to become “one of them” so badly. Although most people that don’t practice skateboarding think of it as a simple hobby, if you ask any skateboarder out there they will tell you that it’s a lot more than that: for them it’s a way of life. And we understand them because, c’mon, have you seen what skateboarding looks like? It breaks boundaries and social rules just to make us rethink our everyday reality and problems. Skateboarding actually is a creative force that drives fearless people into unknown parts of their souls and that’s why it’s so addictive and powerful. However, with skateboarding it’s not all fun and games. If not done right it can be a really dangerous sport. This is why no matter what you do and no matter how long you’ve been boarding the streets, you have to make sure you always follow some general rules. In skateboarding the deck is your life and soul – if you choose the wrong one you’ll be doomed to have a very bad skating experience. This is why when you buy skateboard decks make sure they are made of high-quality materials. Since normally most decks are made of wood, you have to make sure when you buy skateboard decks they are made of durable and quality wood material. Some of the high-quality wood materials include: Canadian maple, plywood, bamboo and birch. Besides the material of the deck, make sure you examine closely the wheels and the bearings. As I mentioned before, skateboarding can be dangerous. And I know making tricks and boarding down the streets or the boardwalk is super cool and it makes you feel like the ultimate rebel around, but don’t forget that a simple mistake could be fatal for your skateboarding career. So whenever you get on that skateboard make sure you wear a proper helmet and some pads that will keep you safe from injuring your legs and arms. Skateboarding is all about practice. Don’t forget that even masters were all once beginners. Don’t go too hard on yourself and always remember that by going slowly and patiently the results will be better and quicker. Even though we in Australia don’t feel the colder months in the year the same way other countries do, thanks to our naturally warm climate, we’re still prone to flues and colds. Trying to maintain a healthy immune system requires a lot of care. One of the best ways to ensure you skip this flu season is by having proper nutrition. This will help you fight infectious illnesses which could be reason enough for you to miss gym sessions and therefore, will keep you from reaching your fitness goals. In the past few weeks I’ve been hearing and seeing a lot of infections and viruses spreading around the gym. Sniffling, coughing and sneezing are just some of the symptoms that announce flu season, and honestly, if you see someone having them, you should keep your distance. But that’s not always possible in the gym as there are ill people who don’t necessarily show symptoms. To best prepare for the flu season and successfully avoid getting infected in the gym, take these 3 simple steps: drink a lot of water, take immune support supplements, and don’t overwork your body. Let’s discuss all of these more in-depth. 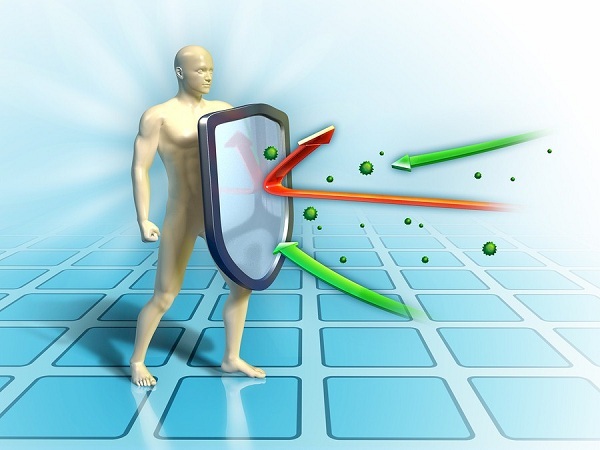 There are a couple of immune support supplements you can take to maintain a healthy immune system, with the main ones being antioxidants and supplements made from herbs. Antioxidants preserve and protect the compounds of the body from free radicals (oxygen atoms with 1 electron), which can damage tissues and create health problems. These molecules are linked to diabetes, cataracts, aging and cancer. Out of all the nutrients we can consume, 6 of them offer support for the immune system: vitamins A, C and E, the minerals Zinc, Selenium and Sulphur. Taking enough of all these nutrients on daily basis will definitely help you remain healthy and avoid illness during this infectious season. Isak Dinesen was right, salt water is the cure for anything. This goes to show why a trip to the ocean can be so therapeutic. Humans and the ocean – an unbreakable bond that has been existing for millennia considering there are many scientific theories showing every living being on this planet originated in the very depths of the ocean. It’s an innate connection if you will, considering water is our source of life, relaxation and enjoyment. Any adventure seeker would tell you water sports have plenty of fun potential when you want to break away from the monotonous daily routine. 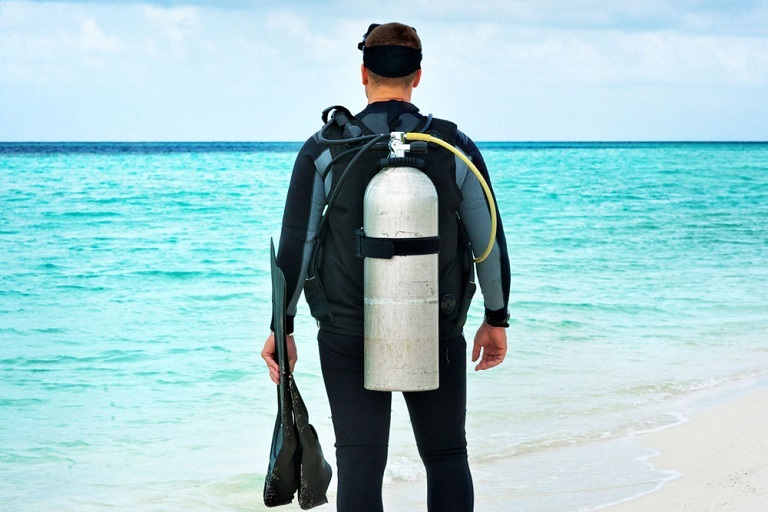 There are of course those ocean activities that outweigh others in the joy they offer; such is the case with scuba diving. Since this year Easter comes a bit later, it gives us yet another reason to impatiently wait for it and enjoy the days off with our family and friends. It’s been a long time since Christmas holidays and we all need a few days to feel jolly yet again. In my family we have a fun Easter tradition: we all go fishing. The only things that change each year are the river and my cousin Sal’s girlfriends, everything else is practically the same like it was 20 years ago. My mother prepares all things sugary and sweet, my uncle is our barbecue boss (we bake what we catch), my aunts are responsible for the cocktails and my job is to teach all my little cousins how to fish. So yes, my family is addicted to fishing. However, I’m the only one who cares about the equipment, so I make sure everything stays clean and in order because I’m also the only one who likes to keep the tackle bag perfectly organized. 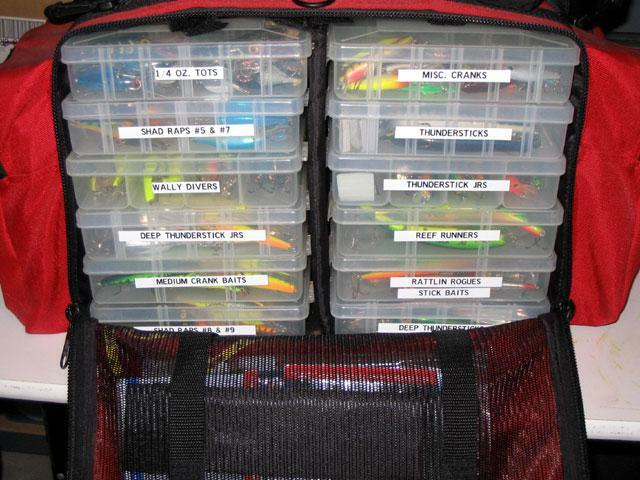 I’ve tried to share some tips with my family on how they can organize their tackle boxes, but they never bother to listen to my suggestions. This is why I decided to share my all-mighty organizing skills with a bunch of strangers on the internet who hopefully will appreciate the effort. 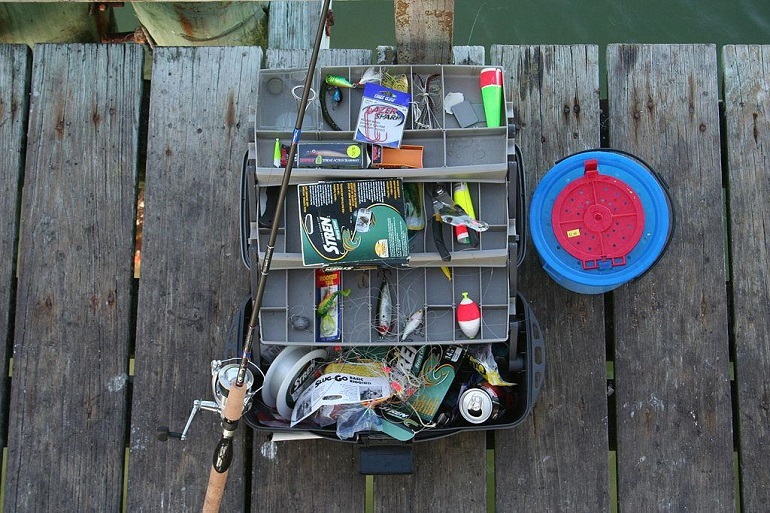 However, before going any further, I need to tell you that every fishing bag should offer enough storage where you can conveniently organize all the stuff. When I bought my most recent soft tackle bag it came with another, smaller bag and they both featured supple plastic webbing for storage for the most frequently used items. The large bag includes 2 X 370 tackle boxes while the smaller one comes with 2 X 360 tackle boxes. The first thing I do is separate my lures into two main categories – hard and soft. The soft ones are divided into those fished above bottom (floating warms, frogs, flukes) and those fished on bottom (tubes, warms, lizards). I classify the hard ones according to depth and profile. For example, a Rapala DT-6 fits the small profile while a DT-16 fits the bigger profile. 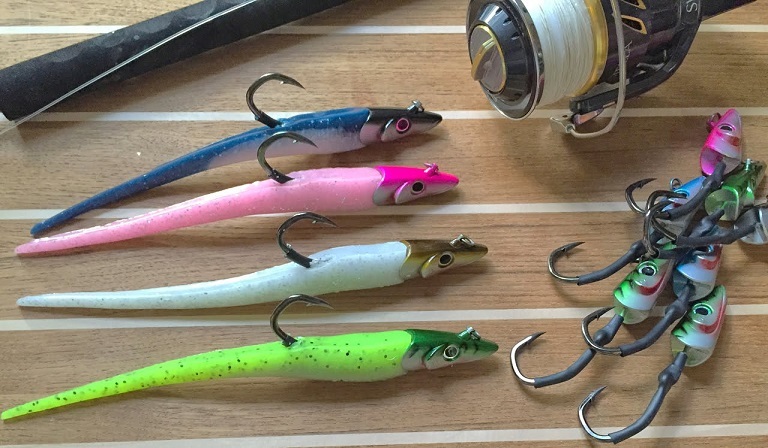 Depending on the types of lures you’re using, you can separate them by size, action or color. Don’t forget to bring as many hooks with you as you can. Even if you are an experienced fisherman, you still need small hooks. That’s why you can see me carrying a wire hook, a kahle hook or even a thick gauge hook because who knows when big fish all fishermen dream of might appear. I organize my hooks in small utility boxes dividing them according to their size. Since I love colorful things, I place the small ones (from 5 to 1/0) in a green box and the large ones (from 2/0 to 5/0) in a blue one. Although I have perfected organizing my tackle bag, I always want to be 100% sure that in case of emergency, I will be able to grab the right lure or hook. Also, since I take a lot of items with me, it’s easy to forget where exactly I put the floating warms especially if I’m in a hurry. So labeling my tackle and utility boxes is the last thing I do when I prepare my fishing equipment. Lastly, it’s important to know where you’ll be fishing and what kinds of fish dwell there. That’s why I arrange my tackle bag prior to every fishing trip – my organization method depends on the equipment I take with me. I like to think that we live in the golden age of gym supplements, which motivates a lot of young people to start working out and achieve their results faster than they could a couple of years ago. 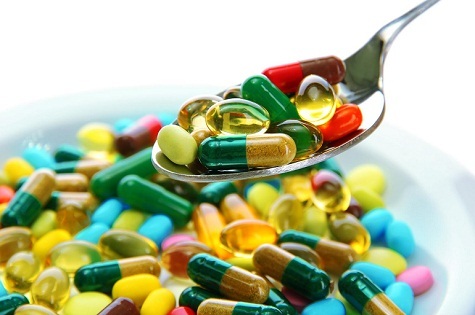 At the forefront of all supplements lies protein, as the single most important and most consumed supplement. But with so many protein powders on the market, it’s a tough decision to pick the right one. Protein can be viewed as the bricks of the body, and I’m glad more people are finally starting to embrace its power. It helps grow and repair muscles after working out and it undeniably helps the body’s performance, strength and composition. So if you’re looking to get into fitness and work on your body and overall health, the first thing you should do after getting a gym membership is buy powdered whey protein. Why whey protein precisely? Internal combustion engines are known for making a lot of noise while running, which can be very annoying and exhausting to your ears, especially while on long rides. Thus, mufflers were invented to reduce this noise generated by the exhaust system. 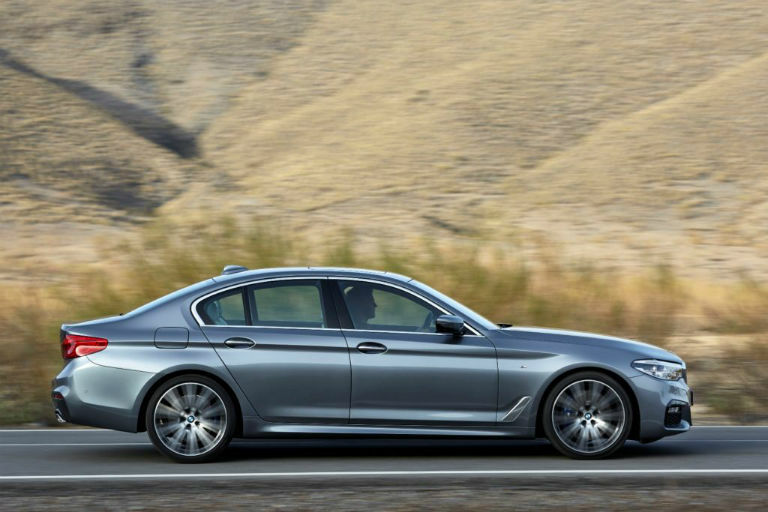 However, an even newer solution to the unwanted noise is the exhaust resonator, which further reduces the noise by making sound waves that cancel other noises out. Fishing is rightfully considered one of the best hobbies a person can have if it’s relaxation and the chance to catch a hearty meal is what you’re after. Since it’s a kind of philosophy of its own, it takes making it part of your life to be able to truly understand it. The fact it’s beaten the test of time and is still very much popular just proves its effects on people. There comes a point in every skateboarder’s life when he breaks his beloved skateboard or at least breaks some of its parts. If you haven’t broken the board itself, then you probably won’t have to worry about changing much. The wheels are the part that is most often changed, which makes many skateboarders disregard the fact that they should take care of the skateboard trucks as well. For the newbie skaters who have no idea what these pieces are – the skateboard trucks are the parts which hold the wheels. There are usually two trucks per set up, each one holding two wheels. One thing that’s definitely a big deal for devoted fishermen is taking their pliers without asking and on top of it all – using them improperly. I learned that the hard way, after making my dad so mad that he stopped talking to me for a whole week! I couldn’t believe a pair of pliers could be so important to a man. That is, until I started fishing myself and started using different types of pliers to do it as professionally as possible. Pliers are important for fishermen. We use them for tuning the pull direction, for cutting and crimping and other areas of fishing where a good fishing plier can find its most effective use. So if you’re on the beginning of your fishing adventure, or you haven’t been using pliers and your fishing tactics was everything but easy and enjoyable, go through these three steps on how to choose suitable pliers for your needs. Saltwater can do a lot of damage to metal. If not cleaned from the salt, some types of metal that have been drowned in salt water would be useless after some time, because of the layer of corrosion. Metals corrode rather easy when in salt water, and any blade that has been in it is useless afterwards. You can try to clean it but it simply won’t be the same afterwards. What you can do to prevent this in the first place, is to choose an aluminum fishing plier which as the name says, is made of aluminium. This metal is corrosion-resistant and it’s very easy to machine it since its properties for anodizing it are widely well-known. Aluminium is a great metal – very rigid and lightweight. But it’s also soft in composition, which is kind of a disadvantage when it comes to the degree of effectiveness of the jaws. For good, strong and durable jaws, manufacturers of pliers turn to another material: stainless steel. Stainless steel can be heat-treated with as much as 60R (R stands for the Rockwell scale for hardness). That way they can be designed as very effective knife blades and when they’re coated with a Teflon impregnation, the combination results in a very effective blade that doesn’t corrode much. It’s not just to say that you own the pliers and have them in your fishing tool box – you actually need to use them as much as possible, since you bought them to serve you on your fishing adventure. And if you don’t use them, that would normally suggest they aren’t really comfortable to use. 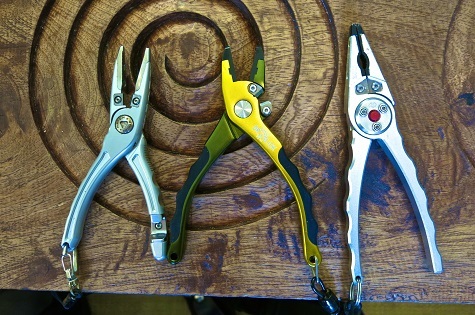 Pliers that are comfortable for use have good, strong handles which have two lanyard holes for added security. Also, there would be a spring made of durable material such as stainless steel, and a locking mechanism to provide more safety and protect the pliers from damage. 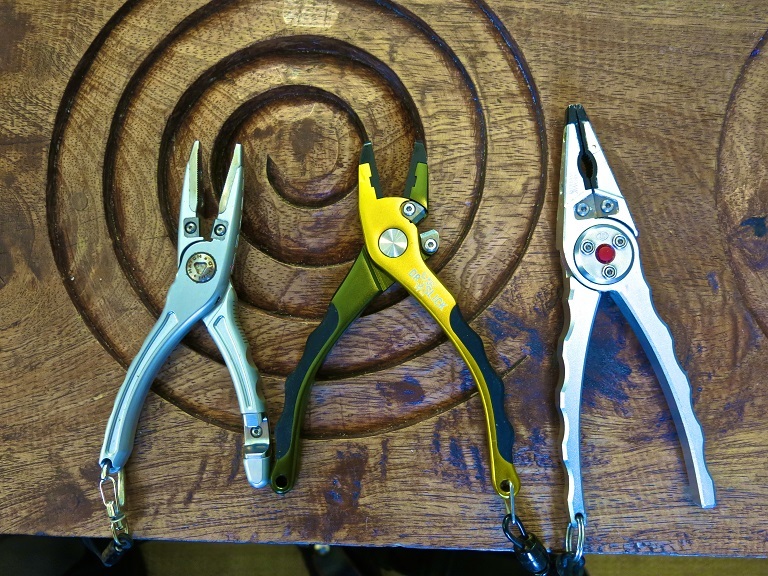 Make sure to choose the right size as this is a crucial factor for comfortably handling the pliers. You’re too impatient. You can’t expect a big result on your body only a few days after you’ve started with the new diet and go back to eating junk food just because nothing has improved overnight. Impatience is probably the strongest excuse why people can’t seem to bare a diet and I know it can be really annoying, but keeping up with the schedule you’ve started is a key for losing weight. But with all the great inventions humankind has come up with all of that can be achieved with the right products for weight loss that won’t cause any bad side effects but will make you feel confident and pleased. If you combine eating exclusively healthy, working out a few times a week and consuming some of the many products for weight loss, you’ll be amazed from the changes. These products normally focus on controlling the appetite and suppressing unnecessary cravings. They will keep your metabolism and energy levels strong during the day and will help you burn the fat easier and faster. The greatest thing about these products is that you can choose from weight loss supplements, fat metabolisers to appetite suppressants and Thermogenics. There’s no right one, they are all good and effective, it just all depends on what you’re looking for in the supplements. Some of the products for weight loss are designed to transport the fat into a cell that will be burned as fuel during exercise others increase the body’s temperature and that way are enabling you to burn calories as heat instead of storing them as fat. Using the products for weight loss while sticking to a healthy diet and working out will give you perfect results in no time. The most important thing is to listen to your body’s needs, not your crazy taste buds. If you give your body the vitamins and fibers it needs, you’ll forget about junk food and you’ll start enjoying a more comfortable and happy life. Being so pressed for time and living a fast paced life makes way for monotony. It’s no surprise you’d often hear people complaining they need some change in their lives, go to far off places and put their troubles behind for a little while. Who doesn’t like discovering the secrets of the world and visiting foreign lands? The problem is we may not always have the time or money which can really be the giving up point for most people, but if you’re really up for great adventures, you can find great places to explore even near you. Take caves for example, though not all of them are completely unexplored, they aren’t exactly the cup of tea for many. Sometimes I think how boring of a place the world would be if not for the fun and excitement riding a motorcycle provides. Just having the possibility of visiting far off places and escape the boring surroundings, meet more motorcycling enthusiasts, make new friends and join motorcycling groups is what it’s all about. Whenever I’m in the company of my motorcycle, I feel as if I have wings to fly and some sort of invincibility particularly when I see the looks on people’s faces who are stuck in their cars in the kilometres long traffic congestions, envying me for making my way through with ease. The feeling of flying and invincibility are just some of the reasons why you should take up motorcycle riding. As much as I feel invincible though, I bet many would agree there’s also some sort of danger with these rides, more so than with cars, let’s say, however when you have the right equipment and ride around with caution, changing the speed accordingly, there’s nothing to worry about. Talking about the essence of equipment, one can’t be considered a true biker if not for the use of a helmet. Safety always comes first, and since in case of accidents, the head is the most vulnerable part, having the proper helmet makes a world of difference, providing all the protection since it can absorb the impact and act as a shield. With plenty of shops, both local and online, and their big assortment of motorcycle accessories, I’m sure you’d find the perfect helmet for you. Here are a few steps to get you to a wise purchase. First, decide whether you’re more of a full face or open face helmet fan. The full face helmet, as you can guess from the name, covers up the whole head, and it’s got a visor that can be placed up and down for eye protection and face access. Open face don’t protect the chin but they cover up the back and sides of the head and you can get a face shield if you want protection against insects and dust. 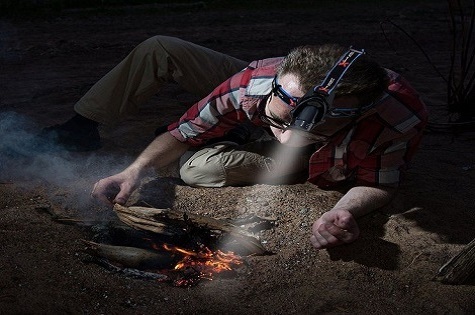 Then, there are also half face helmets, but they are the least safe option of the three, so if you want to get the safest go for the full face. The next step would be to consider the size. A helmet should feel tight to a certain degree where it covers most of the head but not as tight so as to cause you discomfort. The same goes for all the rest motorcycle accessories that should be part of your full motorcycle outfit such as the ideal pants, jacket and boots. Having good peripheral vision is also something to look for, so you’d be able to see well side to side. Once you’ve got size covered, think about the weight. This is where materials and aerodynamics step into the spotlight. Fibreglass composites and plastic are the usual choices, but there are also those made of carbon fibre which have a longer lifespan and happen to be stronger than steel. The better the aerodynamics, the more prevention of a helmet lift. After covering the functional safety points, you can focus on the aesthetics and choose from the variety of colours and designs you’d most feel comfortable wearing. 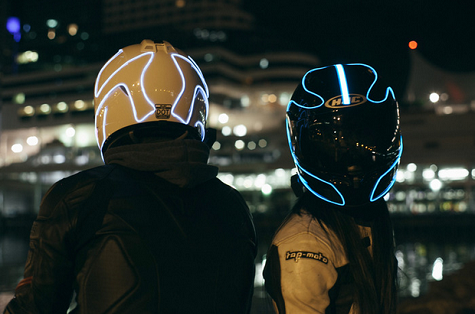 Riding a motorcycle is all about style and that’s also something the helmet can assist you with. 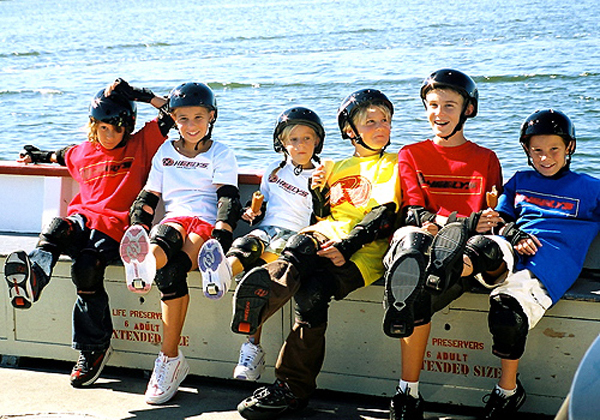 Roller skating has been one of the most popular activities in the past decade. It is the perfect means of transport for shorter distances and great way to have some fun. However, roller skates are quite expensive and not everyone can ride them. On top of expensive, a kid can easily fall from them and seriously injure themselves. Luckily, today there is a pretty popular kids toy for both girls and boys that has taken over the market of roller skates – Heelys. You’ll often see kids “ghost-gliding” besides their parents while in the mall or pavements, leaving people confused while having a great time. From my personal experience, my kids absolutely adore Heelys. But before I bought them their first pair, I did some research on the types of models I can buy. I suggest you do your research as well before you decide to buy Heelys online, and make sure you know what you’re getting for your kid. When you look to buy Heelys online you will generally see them categorized in two basic sub-categories – one wheel and two wheeled models. While both are extremely fun and there isn’t much of a difference between them, they both offer unique features and advantages over the other. One-wheel models are much easier to maneuver with and can reach higher speeds. However, the disadvantage lies in the balance, as kids with poor balance will find them more difficult to ride than the two wheeled model. 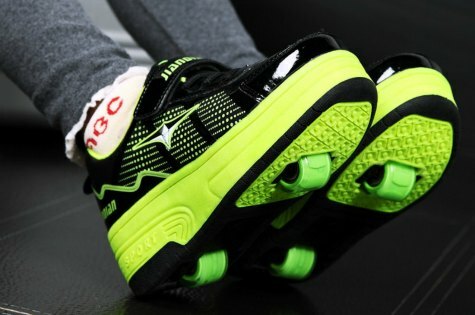 Two wheeled Heelys are a more recent model and offer a better control and stability. You have the option to remove one of the wheels if your kid likes a challenge or just see how a one wheeled model feels. First, tell your kid to start walking with a slight preference on their toes, just try lifting them up as they walk. 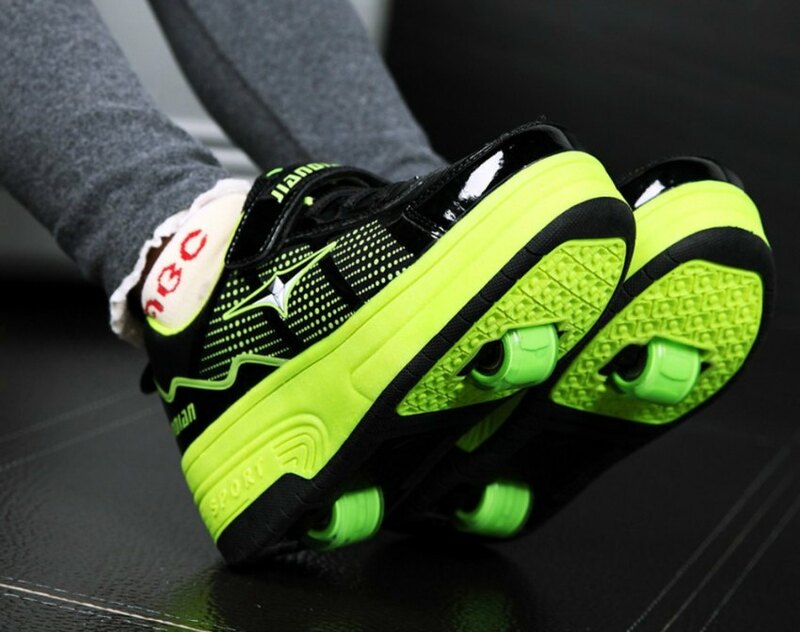 This will allow them to learn how to balance for more than a few seconds and is essential to have a leading foot, meaning, having one foot in front of the other. They should do this for the sake of balance and improved stability. Secondly, tell them to slightly bend their knees. This will allow them to change surfaces (like from street to pavement, and vice versa) without injuring their feet. This will also help them balance, and relaxed muscles and joints will “accept” bumps more mildly. It’s also important to always look forward. I understand this might be hard at first, but they have to look at their surroundings and don’t pay much attention to the movement. Instead, look at objects that look still. And lastly, they have to mind the speed. In order to stop, they’ll need to put down their toes and sometimes even do run-out motions to slow down to walking speed. If they go too fast and want to instantly stop, they can easily injure themselves. You’ll all agree with me that discussing whether riding a bike can improve your health or not is plain stupid. With all the scientific research done on the matter, it’s more than clear that riding a bike is more than beneficial for your body and mood. And with spring coming along and all the trees and grassy surfaces starting to bloom and become green, it would be a shame to limit yourself to a stationary indoor bike. I mean, wouldn’t you want to breath the fresh air, enjoy the sightseeing around you and be amazed by all the beauty of nature while you do some real exercising? Of course you would. The obvious solution? A mountain bike. Mountains in spring are a piece of art, no need to elaborate on it. 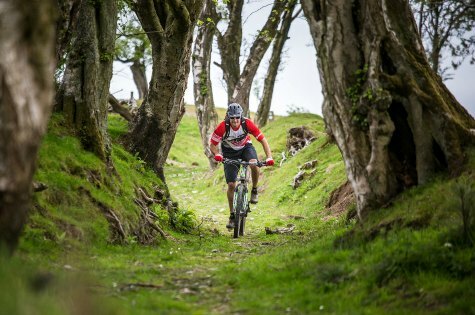 And thanks to the widely practised culture of mountain biking around the world, it would be a shame for you not to own a mountain bike and be trendy at least. 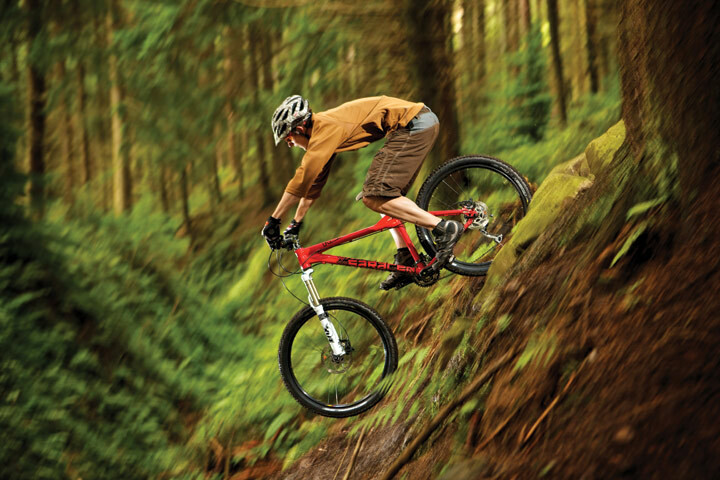 If you still don’t have yours, start searching for mountain bicycles for sale. Don’t be scared by the vast offer of bikes and all the models, colours and price tags; I know it’s hard to choose, which is why I’ve made a simple 3-steps guide to help you. I know you probably think that money won’t be a problem (because you’re royalty and you should have what you want), but let me remind you that you’re not shopping for socks here. A mountain bike is significantly more expensive than an ordinary one, so you need to establish you upper limit to avoid major shocks. You can choose a penny pincher for $500, but you should be prepared to replace it after a year or so of using. Also, you can go a class up and choose something ranging between $1000 and $3500 which means higher quality, better features and of course, durability. It’s important to have a budget established before you start searching the mountain bicycles for sale offers so you don’t waste time and get your hopes high. What type of biking will you be doing? Terrain is a very important thing in mountain biking as there are mountains and there are some really scary mountains. If you keep riding only on local trails with a few trips to serviced trails a year, then you need a trail bike, or an XC. A downhill bike is not appropriate for this purpose and buying it would be a waste of money. So, before you go and buy the bike, make a plan of where would you be riding it and inspect the terrain. When it comes to making an investment such as buying a bike, paying attention to details is important because you want to be happy and satisfied by your purchase and not find it hard to look at. After you establish the budget and the purpose, start researching details like the material used for the body, the type of brakes, the handles and all the additional extras. There is a number of combinations of features you can choose from, according to your desires. Also, consider the brand and choose one that is reliable. In conclusion, what other way is there to keep your perfect physique and blood flow than getting out there and sweating? Buying a mountain bike is easy, but it does require you to open your computer and research a little. And if you’re not convinced about the mountain bike being your health genie, research that too. Plus, there’s no better way to make an investment like this one than being completely informed about what’s best and what should be avoided.